Pre K - 12th grade students must wear shirts with a collar and sleeve and may choose from the following solid colors: white, gray, navy blue, royal blue, or orange. With the exception of school insignia/logos, shirts may not have logos, labels, words, or pictures larger than one square inch.Shirts must be appropriately sized and must hang no more than three inches below the hip bone. Shirts with “tails” or uneven bottoms, or any shirt that hangs more than three inches below the hip bone must be tucked in. Shirts must be long enough to cover the midriff. Undergarments may not be visible at any time. Students may wear a SMOD - colored T-shirt or SMOD - colored turtle neck under the SMOD No see-through or mesh clothing that will reveal the body or undergarments will be allowed. Clothing will be worn appropriately (not inside-out or backwards, not partially on, etc.). Students may wear a SMOD colored sweater or SMOD colored sweatshirt without pockets over the SMOD shirt. Coats may not be worn inside the classroom. Exceptions may be made by the principal or designee in the case of heating malfunction. Coats, SMOD colored sweaters, and SMOD colored sweatshirts with “hoods” are acceptable, but the student is prohibited from wearing the hood on the head while inside any school building. Students may wear a SMOD colored sweater or SMOD colored sweatshirt without pockets over the SMOD shirt. Colors: solid khaki, navy blue, or black. With the exception of school approved logos, pants, skirts, jumpers, capris and shorts may not have logos, labels, words, or pictures larger than one square inch. All must be free of graphics, laces, and embroidery. Shorts, skirts, skorts and jumpers will be no shorter than three inches above the top of the knee when standing. No splits or slits in skirts or pants will be allowed. No jeans or overalls will be allowed. No cargo pants or cargo shorts will be allowed. Form fitting or skin tight material, bedroom pants, lounge pants, or exercise pants will not be allowed. Clothing must be appropriately sized. No baggy or sagging pants or shorts are allowed. No “low rise” clothing is allowed. Pants with a waist below the hip bone must not be worn. Pant bottoms cannot have ragged or torn edges and cannot drag on the floor. Clothing will be worn appropriately (not worn inside-out or backwards, no rolled up pants legs, or no pants tucked into shoes or socks). No see-through or mesh clothing that will reveal the body or undergarments will be allowed. 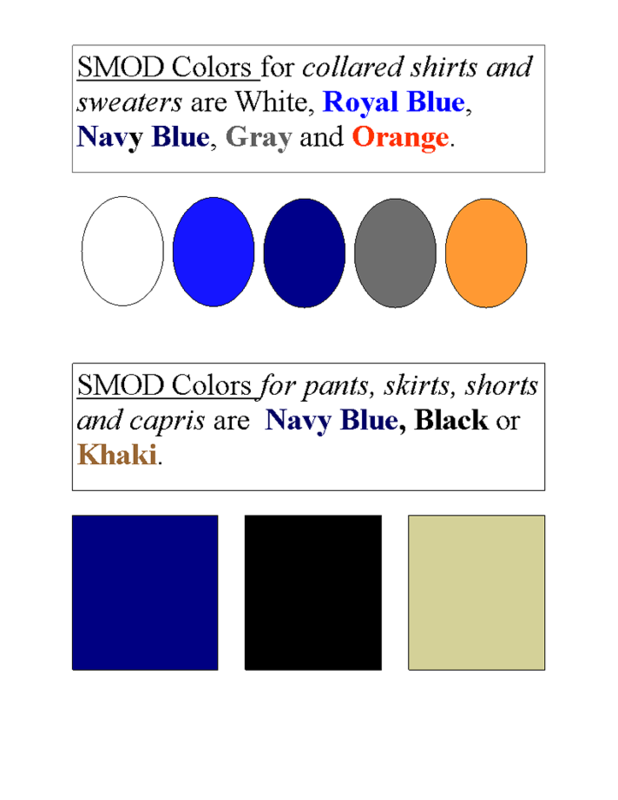 Sock colors:black, brown, gray, navy blue, white, and SMOD colors. Socks must match each other and, if worn, must be worn on both feet. Shoes that have laces must be laced and tied.Laces must match shoe color or be black, brown, or white. No bedroom shoes, “Heelies,” spike heels, or any shoes with heels greater than three inches will be allowed. No flip flops for students in grades PK-5.